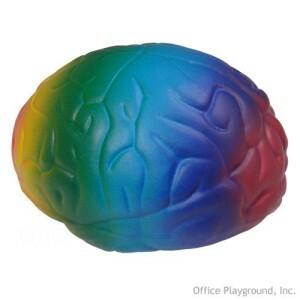 This blog is a continuation of the “Eyes and Brain in the Group” blog. As I was attending the Social Thinking © conference in Long Beach in January, I realized that my “Expected and Unexpected Behaviors” lessons were incomplete. In the lessons I used several visuals for Expected and Unexpected Behaviors. I talked about having “good thoughts” when I client demonstrated expected behaviors in the clinic and “bad thoughts” when he exhibited “unexpected behaviors.” But I hadn’t really used a visual to make it explicit. During the conference, I noticed Ryan Hendrix (one of the presenters) use a red thought bubble for “bad thoughts” and a green thought bubble for “good thoughts.” I felt a figurative light bulb go on in my brain. Wouldn’t it make more sense to hold a green thought bubble over my head than say “I am having good thoughts,” since you don’t always express your thoughts verbally. Just holding up the green bubble without verbally interrupting the session would give the client the positive feedback and the acknowledgment while continuing with your lesson. So of course, the next weekend I had to make the two thought bubbles. I used a generic thought bubble shape I found online and outlined one red and the other green with Do-A-Dot markers to make them bold. I wrote “Yay!” with a smiley face on the green thought bubble and “Oh, no!” with a sad face on the red thought bubble. One of my clients in particular has difficulty realizing that people have different thoughts. What is in his brain isn’t necessarily in mine. So if he is thinking about “m&ms,” he needs to say it so I know what he’s thinking about instead of demonstrating “unexpected behaviors” such as screaming or crying. So having two thought bubbles (one for him and one for me), each showing that we are both thinking about different things (his has m&ms, mine has the activity we are doing) makes it explicit for him. I have to credit Ryan Hendrix for the ideas listed above. I also used Jill Kuzma’s thinking and speech bubbles. You can find the templates on her blog. 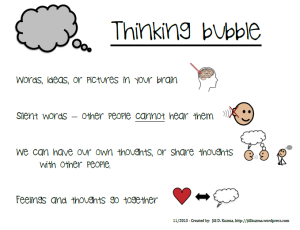 She has some additional ideas and activities that are great to carry on the lessons using thought bubbles. I recently attended a Social Thinking © Conference in Long Beach. It was one of the few conferences I have attended where I found myself writing notes on the sides of ideas and treatment strategies I could use the next day. One of the ideas I used right away was using concrete and visual cues to keep my little ones’ “brains and eyes” in the group. We notice when somebody’s is in the group and their brain is paying attention and their eyes are looking at the activities/ materials. We think that person is doing a really good job participating in the group. We also notice when somebody’s body is in the group, but is does not appear like their brain and eyes are part of the group. It does not appear that their brain is thinking about the same thing as the group. We say, “Your brain and eyes are not a part of the group”. ChatAble is an AAC app developed by Therapy Box, a leading technology company based out of the UK. I was initially interested in this app because it was the only app on the market to give users scene and grid communication options on the same page. What that means is that you could upload a picture or a photograph of a scene, create hotspots that that child could touch to activate a video or audio recording and also have icons or pictures in a grid next to the scene. It is incredibly easy to program. I created a hybrid page (pages with scenes and grids) within minutes of downloading the app. While I think everyone should always read the manual and watch the overview videos before programing any AAC system, I have to admit, ChatAble might be one of the easier and more intuitive ones to set up. My favorite part of the app is the ability to incorporate a variety of media options such as youtube links, websites, iTunes songs, self-recorded videos, and more. While a child can certainly use this app as a communication system, I also use it to build receptive language, vocabulary, and syntax. It is so easy to import personal photographs to create buttons and scenes. By addting hotspots that lead to a video makes it exciting and dynamic for the clients. Really, the possiblilities are endless. Disclaimer: Therapy Box provided my practice with this app to use with my clients. However, all the opinions and thoughts in the review are my own. 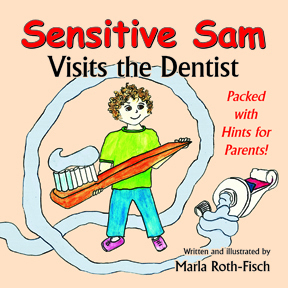 Marla offered me a copy of her book, “Sensitive Sam Visits the Dentist” so I could post a review on my blog. This book is beautifully written and illustrated by Marla to help children with sensory processing challenges cope with their visits to the dentist. It is written in a “Social Story” format, which would be really helpful for children on the Autism Spectrum. Each page has hints and suggestions for parents. Parents and therapists can use it before an upcoming visit to the dentist to prepare the child. I would recommend reading it together several times before the visit so the child is really familiar with everything involved in the check-up and knows what to expect. The sensory information (sounds, smells, taste, etc.) is amazingly detailed and provides out kids with a complete picture of the experience. “Sensitive Sam Visits the Dentist” is a 42-page soft cover book with adorable illustrations. The book is written for ages 4-12 years and has a poetry feel to it with rhyming words. This makes it even more engaging and fun for the little ones. The first 20 pages of the book are for the kids and the last 22 pages are for parents and caregivers. This portion of the book is packed with tips from dentists and dental hygienists. It also includes personal stories from parents, caregivers and therapists with ideas and tips to help with oral hygiene and making visits to the dentists less stressful. Marla’s first book, “Sensitive Sam,” won the 2010 Preferred Choice Award, by Creative Child Magazine. As a parent of a child with sensory processing disorder, she is well aware of the challenges these children face in routine, everyday situations. Visiting the dentist is hard for many children, but this book can make the process easier and smoother for everyone involved. I would highly recommend this book to parents, caregivers, teachers, therapists, and yes, even pediatric dentists. It can be purchased for around $10 on Amazon and is worth every penny! Disclaimer: The author of the blog was given a copy of the book for a review. No other compensation was provided. The opinions on the blog are solely the authors. 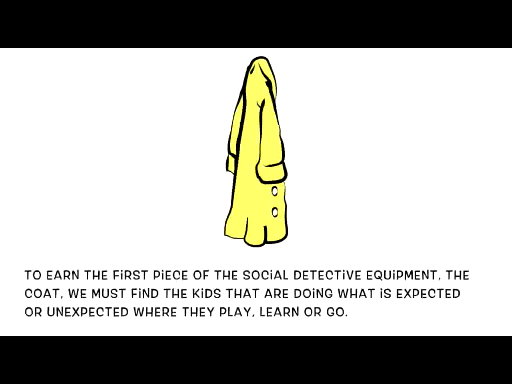 Every one of us is a Social Detective! We are good social detectives when we use our eyes, ears, and brains to figure out what others are planning to do next or are presently doing and what they mean by their words and actions. 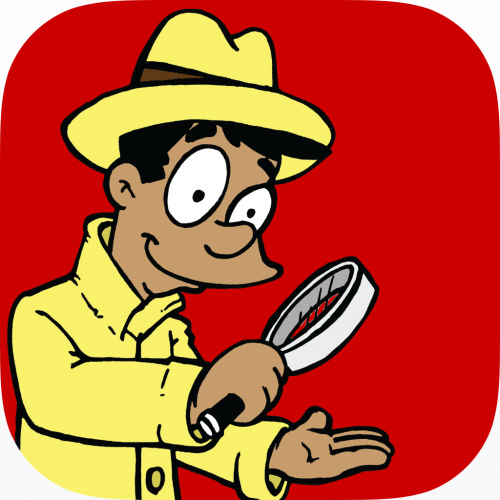 This entertaining and engaging app offers repeated practice to develop social detective skills. 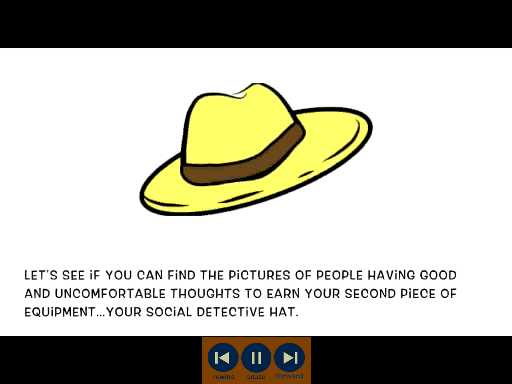 This interactive app teaches children ages 7-12 to become better social thinkers by putting on their detective hats and deciphering both expected and unexpected social behavior. Users will rely on their eyes, ears and brains to make smart social guesses and investigate clues to see how others’ emotions and responses are connected to their own behavior. 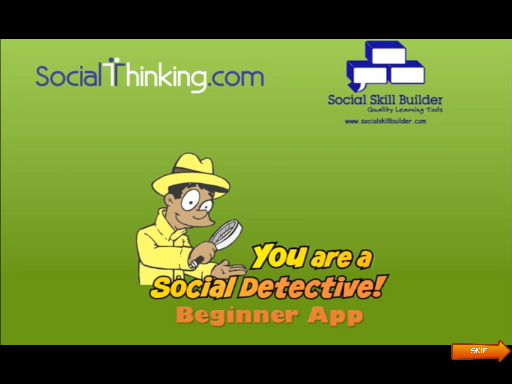 You are a Social Detective! 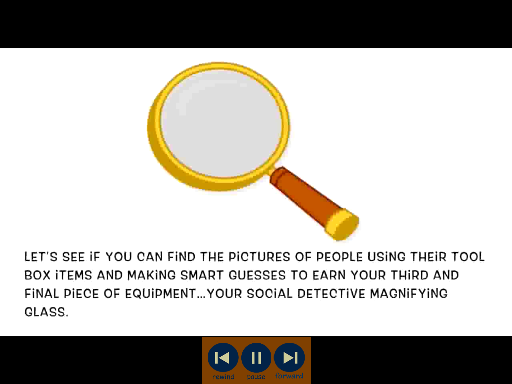 App is the first level of the Social Detective CD. (This is a blessing to all of you, who are like me and haven’t owned a laptop with a CD drive for over 2 years!). I was told this app was in development back in January, when I attended a Social Thinking Conference in Long Beach. I’ve since been waiting for it to be released. It certainly did not disappoint. The app’s creators put together a short video to explain the app, you can watch it HERE. The app itself is easy to use. Moving through the different steps is also intuitive. 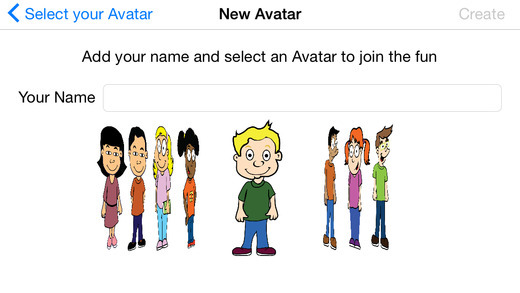 The first step involves choosing an avatar. The child can choose from the different options available by assigning his/her name. 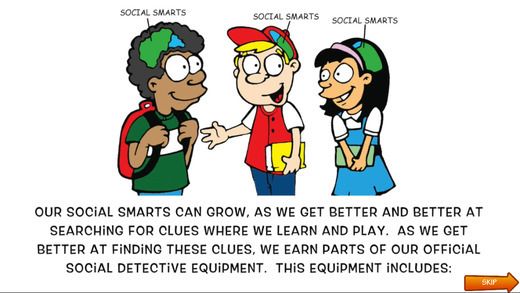 The app also allows the students to review their “Social Smarts.” I like to use the Social Detective Comic Book as a review before using the app. However, the quick review is handy before the students start practicing their skills on the app. (You have the option to “skip” the review if you are using the app with the same student over multiple sessions). For each of the three levels in the app, there is a pretest. Students must get 100% on the pretest before they can move on to the ‘test’ portion for each level. 2) A Detective Hat: To earn the hat, they must show they know and understand the difference between good thoughts and uncomfortable thoughts. Students must identify verbal and nonverbal clues from the videos to show if someone was having good thoughts or uncomfortable thoughts. The app includes 3 still images (pretest), and 12 short videos. For each video the student must identify if the individual is having “good,” or “uncomfortable” thoughts. 3) A Magnifying Glass: The students earn their magnifying glass to complete their Social Detective ensemble by using all of their skills to make smart guesses. The students are required to use their social skill “tools” (eyes, ears, brains) to predict what they think will probably happen next. The app includes 3 still images (pretest) and 24 short videos. This section is challenging because there are two answers per question and does require thought and reasoning. Elementary school-aged (K-5) students, and immature older middle and high school students who enjoy playing on the iPad, may benefit from this app. However, this isn’t just an app for students who have challenges relating to autism spectrum disorders. The lessons also offer a variety of engaging ways to introduce the concepts of social thinking to general education students who may have difficulties with social nuances, emotional disabilities, and younger students with challenges in higher order reasoning. This app also keeps data for the past 5 sessions per student per level. Overall, I thought the videos used in the app were appropriate for a wide range of ages. Videos included scenes from a school, playground, lunchroom, and home. This further widens the scope of its application. 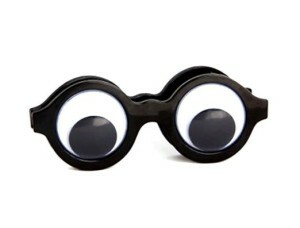 I definitely think it is a handy “tool” for Social Thinking therapists and teachers. You can buy it at the app store for $24.99. Disclaimer: The app was provided for review. However, all the opinions and content of the blog are the author’s. I met AJ in April 2014, a mere 6 months ago. His story makes me realize why I do what I do, day in and day out. When I met AJ, he was 9 years old. He had a diagnosis of Autism. His family had relocated from India to Orange County a few months prior to our meeting. His mother later told me that they had made the move specifically because she wanted AJ to receive P.R.O.M.P.T therapy. His mother also revealed how AJ had been through no less than twelve speech therapists, several ABA therapists, and a few occupational therapists. They had also tried Neuro-Feedback therapy; several detox programs, and nutritional supplements, all in the hope that they would help with speech production. After all those setbacks and disappointments, it still amazes me that this family decided to move across the world to try another program. But I guess hope is a crazy thing. During the initial evaluation, I realized that AJ was truly non-verbal. There were no vocalizations on demand. When asked to say “ah,” he would open his mouth, but there was no sound. He could imitate some lip movements with tactile prompts and cues, but again, without any vocalizations. He did spontaneously babble labial sounds like /baba/ and /mama/, but there was no intentional speech. I realized that at age 9, with little to no progress after years of speech therapy sessions, the odds were stacked against us. When I tried to explain this to his mother, she was quick to respond, “But it can’t hurt to try, right?” I knew then, I had to at least try. P.R.O.M.P.T therapy with tactile cues, in combination with Sara Johnson’s TalkTools® was definitely the way to go. I saw AJ once a week for 45-minute sessions. His mother would sit through each session, carefully taking notes about the activities and target sounds and words. She would then practice all the activities each day during the week. This video is proof of AJ tremendous progress and his mother’s singular dedication. It was taken after merely 25 sessions of P.R.O.M.P.T. therapy. While there is clearly a long way to go, his incredible achievement so far, makes the future look bright and positive. If you are able, I would highly recommend that you attend this conference. It happens about once or twice a year in the L.A. area. It isn’t meant solely for professionals like speech language pathologists and teachers, but also for parents and caregivers of children on the Autism Spectrum and children with social and communicative challenges. There is a special rate for non-professional attendees. The Unthinkables: This deck includes 14 sneaky Unthinkable characters. There are several cards for each character so it is convenient to use with groups. Each character’s name and power is included on the card. The Thinkables: This deck includes 52 playing cards; 3 of each Thinkable , 9 Superflex cards, and 1 information card. Each character’s name and superpower is included on the card. This set is not meant to be used by it self. 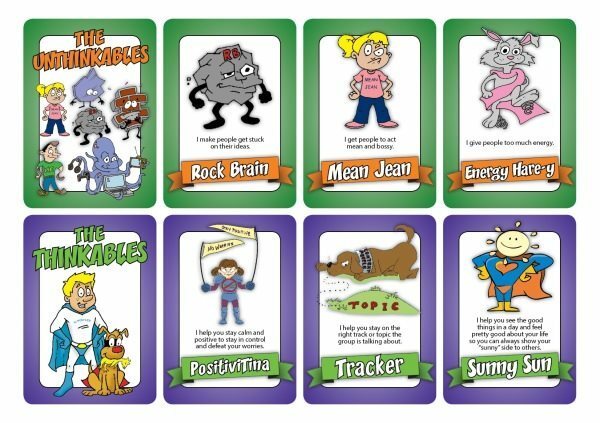 It is a supplement to the “Superflex Curriculum.” Once the students are familiar with the Superflex characters, these card decks are perfect to reinforce the concepts. The cards can be used to play games like “Go Fish!” “Memory,” “I Spy,” “Guess Who?” or simply use them with your student’s favorite game like you would any language or articulation picture card set. To add a little movement to the activity, I place Unthinkables cards face down on a Twister mat. We play Twister and the child opens a card he/she lands on and tells what Superflex strategy they would use to defeat the Unthinkable character. This idea was inspired by the “Tattle Monster” by Giggles Galore . They had used a tissue box to create a monster to take care of all the tattles in the house. And while I think it is an adorable idea, I wondered if I could use it to teach, “expected” and “unexpected” behaviors. So, Mister (or should I say Monster) Expected and Monster Unexpected were born. The initial goal was for the little ones to sort pictures of “expected” and “unexpected” behaviors and feed them to the appropriate monster. But I realized it would be fun for older children to have the monsters in their classrooms or homes and write down “expected” and “unexpected” behaviors during the day and feed them to the monster. What fun it would be to read them aloud at the end of each day! 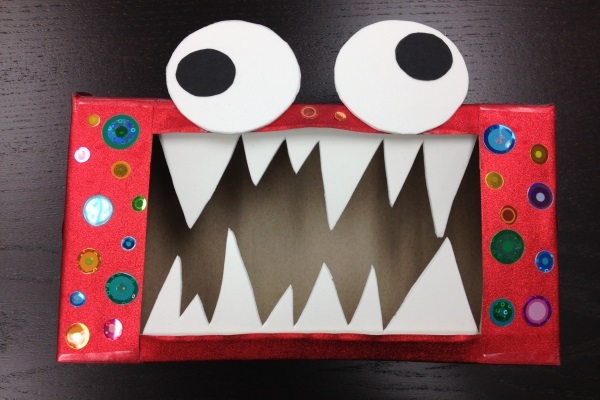 I covered old tissue boxes with red paper for Monster Unexpected and green paper for Monster Expected. I also cut out the teeth with white foam and taped it to the inside of the box, glue on the eyes and the monsters are ready to go. I decorated my monster with stickers to make it fun and colorful. 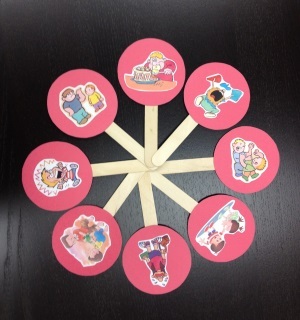 I also found pictures demonstrating “expected” and “unexpected” behaviors and glued them to Popsicle sticks. The students then took turns describing the behaviors and stating whether they were “expected” or “unexpected.” The Popsicle sticks were then “fed” to the appropriate monster. 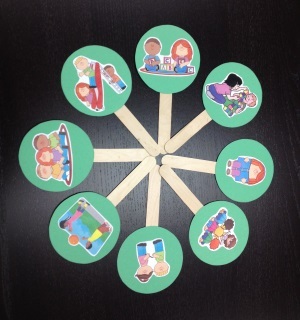 You can download the images I used on the Popsicle sticks here. I am attaching the excel sheet that includes the activities and toys. I tried to incorporate materials and toys that are present in most households or clinics, or are fairly inexpensive to purchase if needed. The categories of activities include: 1) Toys/ games/ art, 2) Cooking, 3) Outside, 4) Books, 5) Songs/music, and 6) Everyday Routines. I wanted to include a wide array of activities to ensure that Amelie was using her talker as much as possible during the day. Of course, an important point to remember is that this is simply a starting point. You can add, change, delete or modify the language and vocabulary in any of the activities based on your client or child. I simply wanted other families and therapists to look at toys and materials they have at home or in their clinics and realize that there are infinite possibilities for using a child’s AAC system to build language beyond requesting. In addition, I would like to note that even though I’ve used “Speak for Yourself” as the AAC system for Amelie, most, if not all of these activities could be used with any other AAC system such as Proloquo2Go or any Dynavox system. put put Put eyes on Mr. Potato Head. but eyes Put ears on Mr. Potato Head. I I want red crayon. want want I want green crayon. like squeeze Squeeze red play dough. change the verb to roll or press) Squeeze pink play dough. make feed Feed the baby doll. put put Put on arms. look see I see bird. a bear I see dog. hear hear I hear lion. a zebra I hear flamingo. book Read Bear Snores On. walk dance Dance to the music. *Disclaimer: I want to state that although I can take credit for most of the content on the spreadsheet above, I have to thank Amelie’s mother for making it pretty and fun to read by formatting it and adding the colors.